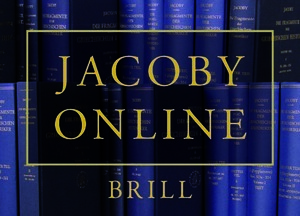 Brill's New Jacoby is a fully-revised and enlarged edition of Jacoby’s Die Fragmente der Griechischen Historiker I-III, providing new texts of the ancient historians in many instances as well as several new historians and many new fragments of existing historians that were either unknown to Jacoby or excluded by him. Especially important is that for the first time ever commentaries are provided on the final 248 historians in FGrHist I-III, which Jacoby was unable to prepare before his death. In addition, and also for the first time, Brill's New Jacoby presents facing English translations of all the testimonia and fragments, new, critical commentaries on all the testimony and fragments, and a brief encyclopedia-style entry about each historian’s life and works, with a select bibliography. Brill’s New Jacoby is nearing completion with final publication of the last historian scheduled for 2019. A list of the available historians in alphabetical order can be viewed in the contents tab below.